Last week, news spread about bomb threat extortion emails that were sent across the US. It appears that the extortionists are getting more extreme with the latest attempt at extorting money from people. Bleeping Computer reports that the new tactic now simply relates to users paying a hitman to live or suffer death for non-payment. Pretty straight forward. Extortions appear to be pushing the limit of desperation following last week's news regarding bomb threats for bitcoin. This week it appears criminals have switched tactics and are now focusing on a more direct threat, your life. 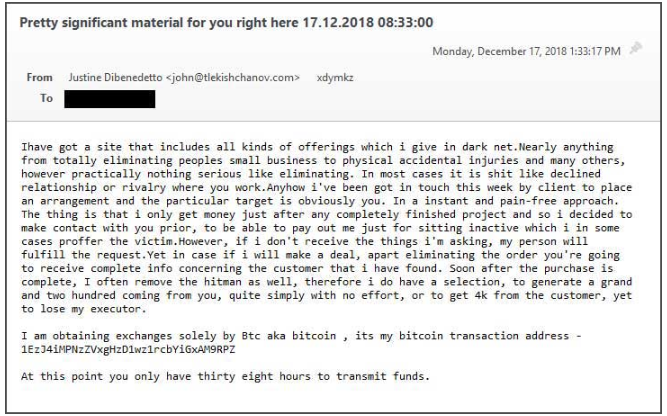 The latest email doing the rounds comes from the owner of a dark web site who claims to have received a "hit" on your life and admits that he can assist you for $4,000 as well as taking care of the hitman. The email is written in terrible english and appears to be very amateur in writing. Scammers appear to be taking more steps in trying to extort money from people and getting paid in BTC. However people do not appear to be falling for these as no transactions have since been received to the above address. People are slowly catching on to this type of scam and eventually it should come to an end, not before we see something more extreme I am sure. Do you know anyone who has fallen for an extortion email?